They aimed well, and struck gold. M.S. Unnikrishnan on Indian shooting stars who brought back a rich haul of laurels from the Commonwealth Games. THEY are a breed apart. They shoot to win, not to kill. And shooting sport is fast catching up in India if the number of medals won by the country in the 18th Commonwealth Games at Melbourne is any indication. There are many world-class shooting ranges across the country and perfecting shooting skills has now become an easy affair. But shooting is a costly sport, which only the rich, powerful and the talented with institutional support can pursue as a serious career. Success in shooting comes only with patience, persistence, dedication and determination. Just one miss, and years’ hard work can go down the drain in a trice. Most of the Indian shooters come via the Services route or have an Army background. Lt Col Rajyavardhan Singh Rathore fought against militants in Kashmir before turning his sharp-shooting skills into an asset to emerge as an Olympic silver medallist at Athens, 2004. Samresh Jung, who struck five gold, one silver and one bronze at Melbourne, is an Inspector with the Central Industrial Security Forces (CISF). And, so is Sushma Rana. Others are either employed with the CRPF or belong to affluent families. Gagan Narang and Abhinav Bindra have rich parents to back their shooting careers. But after making it good at the Asian and Commonwealth levels, both have been getting unstinted support from the National Rifle Association of India (NRAI) and the Sports Authority of India (SAI). The Ranas—Jaspal, Sushma and Sonia—inherited their shooting skills from their father Narain Singh Rana, who was an ace shooter himself. The Ranas have developed a shooting academy in Uttaranchal besides having a small shooting range at their residence in the Shivalik Hills in Delhi. The SAI imports ammunition for shooting camps and competitions at enormous cost to the exchequer, but the shooters’ success in international meets offsets this cost factor. The Indian shooters fared exceedingly well at Melbourne though the competition standard at the Commonwealth level is not that stiff, in the absence of Asian powerhouses like Japan, Korea and China from the fray. Yet, for that reason, the medals won by Samresh Jung and Anuja Jung, Rajyavardhan Singh Rathore, Gagan Narang, Abhina Bindra, Jaspal Rana and Sushma Rana, Avneet Kaur Sidhu, Tejaswini Sawant, Vivek Singh, Pemba Tamang and others is not of any less value. Jung and Narang won eight gold between themselves, and both, interestingly, have some Hyderabad connection. 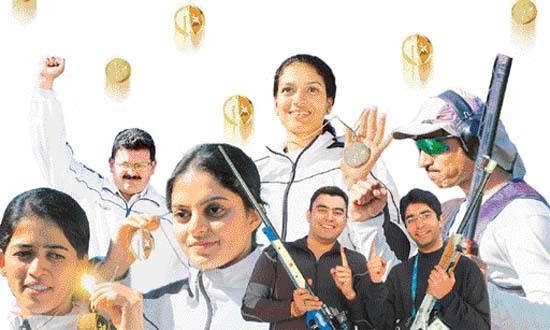 Out of the 22 gold, 17 silver and 11 bronze medals lifted by the Indian contingent, the shooters alone brought in 27 medals: 16 gold, 7 silver and 4 bronze. The weightlifters had performed a similar feat at Manchester (Britain) four years ago, but the shooters have far exceeded the expectations. Why do the shooters do well? Where do they come from? And why do they take to shooting? The shooting champions are an eclectic lot, who also pursue other passions besides following the ‘shoot-hit-and-miss’ routine. Cupid striking at the shooting range is also a reality as it happened in the case of Samresh Jung and Anuja Jung. Married some years ago, the two had met at one of the shooting camps. Pistol shooter Samresh Jung, who had set out to win eight gold at Melbourne, but ended up with five, took to shooting like a duck to water. Son of Lt Col Sheilesh Jung and grandson of a famed hunter of his time, Samresh is employed with the CISF. The Jungs live in an area called Khyber Pass on the outskirts of the Capital. This is not a fashionable address compared to upmarket areas of Delhi where some shooters reside. But the "rustic" background of Khyber Pass gives an extra edge to the shooting skills of the Jungs, who pursue the sport relentlessly, and with focused attention. Employed with the CISF, 36-year-old Samresh is hailed as "Goldfinger", for shooting skills. Samresh graduated from Osmania University, Hyderabad, in 1995 after doing schooling from Modern School, Delhi. He has also secured a diploma in computer science. Jung has been winning medals as a matter of routine ever since he first struck two gold, one silver and one bronze in the second South Asian Federation Shooting Championship in Delhi, 1997. Over the years, Jung has collected a bagful of medals, the notable being the two gold and three silver he bagged at Manchester, and his seven-medal haul at Melbourne. In the run-up to the Commonwealth Games, he had hit three gold and one silver at the Australia Cup. A recipient of the Arjuna Award in 2001, Jung, however, does not favour sportspersons hankering after awards, particularly cash awards. Reigning national champion in free pistol, air pistol and standard pistol, the portly Jung, who was born on May 19, 1970, hit a silver in the 50m free pistol before going for a gold-rush in 10m air pistol, 25m standard pistol, 25m centre fire pistol, 50m free pistol and 25m centre fire pistol, at Melbourne. However, his dream of winning more gold got shattered as he could win only a bronze in the 25m centre fire pistol and nothing in the 25m standard pistol. This setback in the last two events shattered Jung’s hopes of emulating the feats of swimmer Ian Thorpe and Susie O’Neill, who had won six gold each in the earlier games. But the Jungs—either Samresh or Anuja—made a podium finish on all the six days of the shooting competitions at Melbourne, which was a commendable feat indeed. Jung is a cool player who does not get rattled when his shots go astray, and is not given to elation when he hits medals. The Jungs have a two-year-old daughter, and they prefer quiet outings to the hurly-burly of city life. Gagan Narang, born on May 6, 1983 at Begumpet in Hyderabad, took to shooting when his father presented him an air pistol in 1997. He perfected his shooting skills at the backyard of his Majestic Mansion in Begumpet. Like in shooting, he excelled in academics too, taking his Bachelor of Computer Application degree from Osmania University (Hyderabad) with an aggregate of 678. Gagan shot the first-ever gold for India in air pistol at the inaugural Afro-Asian Games in Hyderabad, 2003. When he is not shooting, Narang enjoys driving his green Bolero, listening to music, watching television, doing yoga and meditation. Thirtyfive-year-old Rajyavardhan Singh Rathore, the first-ever Indian to win an individual Olympic silver medal (Athens, 2004), too has an Army background. Son of Col Laxman Singh Rathore, Rajyavardhan’s first career choice was the Army. He has shot several medals though his best is still the Olympic silver. Rathore retained his double trap gold at Melbourne though his score of 181 was below his games best of 191. The greatness of Rathore is that he is mentally very tough and has outshot many Olympic and Asian champions in competitions. The standard of double trap shooting at the world level is very stiff. He is ranked sixth in the world, and is the only Indian to figure in the ISSF (International Shooting Sport Federation) ranking list. Rathore was part of the Army’s counter-insurgency operations in Kashmir before he turned his full attention to the sport. Abhinav Bindra, son of leading Punjab exporter A. S. Bindra, was born with the proverbial silver spoon in his mouth. The family has bungalows in Patiala as well as in Defence Colony, Delhi. Naturally, he got a headstart over others in matters of facility and choice. He won prestigious awards like the Arjuna Award, the Rajiv Gandhi Khel Ratna Award and the K K Birla Foundation Award while he was still in school. He shot the first gold for India in the 10m rifle team event at the Manchester Commonwealth Games four years ago and finished seventh at Athens last year. With a rich businessman father to back his shooting career, Abhinav can look ahead with hope, though he’s yet to fully realise his potential. From three gold and two silver at the 1994 Victoria Commonwealth Games, Indian shooters have come a long way. Their medal tally at Melbourne was two gold and one bronze more than what they shot at Manchester. But what India really need is many more Asian Games and Olympic champions, not just one Rajyavardhan Singh Rathore. Chief coach Sunny Thomas has rightly noted, "Shooting is on the right track. We can only get better from here."